CARE began working in Chad, one of the world's poorest countries, in 1975. We work on a number of long-term programmes to improve quality of life in poor communities, with projects on water and sanitation, earning a living, farming, natural resource management and gender-based violence. We also work with the many refugees fleeing from ongoing violence and conflict in neighbouring countries. We offer psychosocial and humanitarian support to refugees from the Central African Republic and South Sudan, including food and other essential items, access to clean water and sanitation, training and opportunities to earn an income. more than 90,000 Chadians displaced within the country as a result of the 2012 drought in the Sahel region, which was then followed by massive floods destroying newly-cultivated land. Today millions of people wonder where their next meal will come from and if it will be enough to survive on. Chad also has the lowest rates of access to water and sanitation in the region, with only 44% of households having access to water and merely 12% having access to acceptable sanitation structures. CARE is UNHCR's key partner in Chad and one of the few humanitarian agencies to work in all five Central African Republic refugee camps on the Chad-Central African Republic border, providing access to shelter, water, sanitation and food. In the south, we are continuing to provide water and sanitation facilities (latrines, washing spaces, refuse pits, drainage, etc.) for newly-arrived refugees in three camps. We are also working to help provide emergency shelter, infrastructure support and expertise in building community facilities. When the food crisis struck Chad, CARE quickly intervened to help people access food and cash, seeds and tools, water and more. 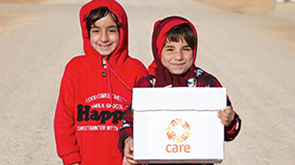 During the most acute period, we distributed cereals, beans and oil to approximately 200,000 people, including almost 29,000 children under 5 who also received a special nutritional food supplement to compensate for the loss of vitamins, proteins and other important micronutrients important to their growth. We also helped pregrnant and nursing mothers with supplementary food to ensure adequate nutrition for themselves and their children. During the floods in the region, we assisted people in Chad and flood-affected refugees from the Central African Republic, including through the reconstruction of shelters and schools, the refurbishing of hand pumps, and support for community centres for women and people with special needs.